"How shortsighted must you be: to take your own life over matters of the heart? How self-absorbed? How selfish? Dumb? Just plain dumb." 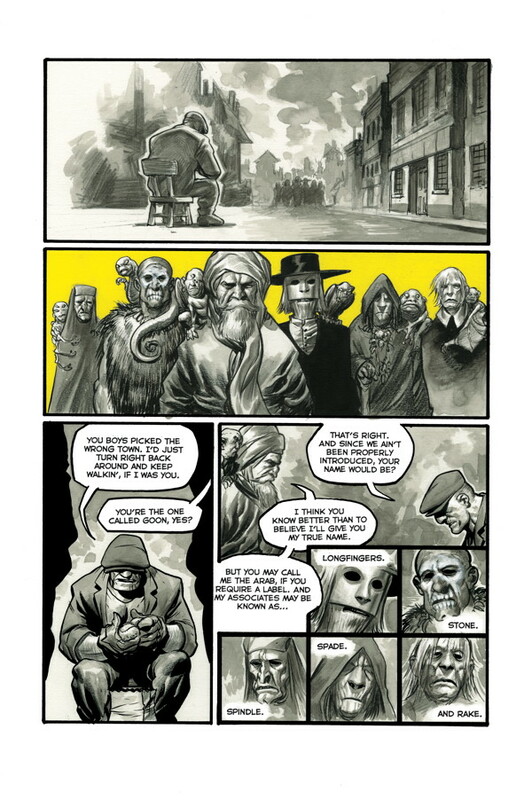 The Goon is a character who really doesn't need much of an introduction to many. The thing is, there are a good number of readers who really don't know much about him, which is a shame. Any books featuring the character are always great reads and Dark Horse is adding another book to that repertoire in The Goon: Occasion of Revenge #1. The issue is written and illustrated by Eric Powell. There are numerous complexities to love, many of which Fred Paulsey was subjected to in his advances toward Sandy Wayne. It's a story that reminds The Goon of a previous memory and love lost, snapping him back into the present and a drink at the bar. That drink is rudely interrupted when Noodles sends a message about some action preparing to go down, prompting The Goon to rally Mudd, Kid Gargantuan and Franky to a defensive cause. They're going up against a group of foes named The Arab, Longfingers, Stone, Spindle, Spade and Rake. Things are getting tough for The Goon and that sense doesn't appear to be letting up any time in the immediate future. Powell has always written The Goon with a certain level of sophistication behind the bar brawls and that trend continues in Goon: Occasion for Revenge #1. The Goon doesn't really enjoy fighting, but he knows it must be done to protect the innocent and has no qualms about doing it if the situation is right. Powell manages to deliver that message in a way that feels completely natural for the character, presenting his stoic combat prowess alongside the more brash humor of Franky. And the enemies in the book are very intriguing; not just in name, but in appearances that are very befitting of those names. Powell paces the book with extraordinary precision, carefully crafting a tale that comes full-circle by the end and reads in an exciting fashion. 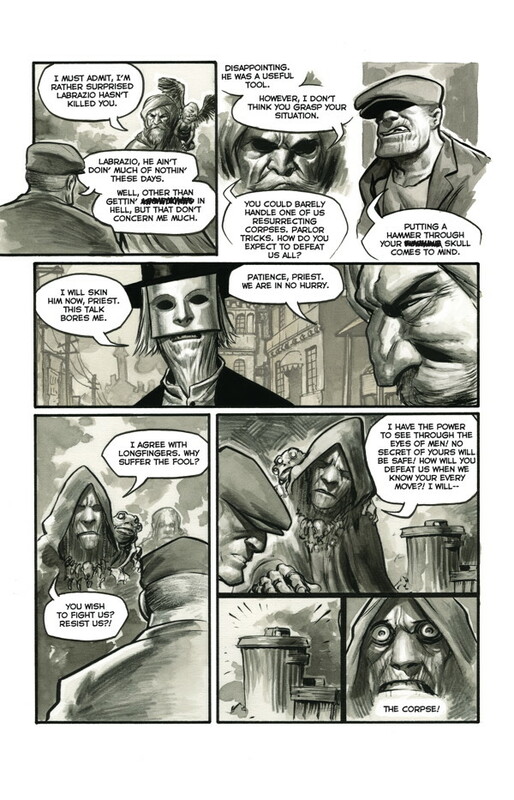 The Goon is one of those characters where the writer is also the artist and it makes a very positive difference when it comes to illustrating that character. Powell definitely has a handle on him and presents the character in his trademark noir style. There's a heady blend of past and retro in the book, something that places the book in a time that feels just nostalgic enough where the reader feels like they're visiting a story of the past. The beauty of the work is that it doesn't rely on excessive detail to get across the action; Powell's scratchy style is relatively simplistic with ample accents on shading and cross-hatches. Panels are also done in a way that makes it feel like you're looking through a photo album, as they're meticulously placed next to one another. 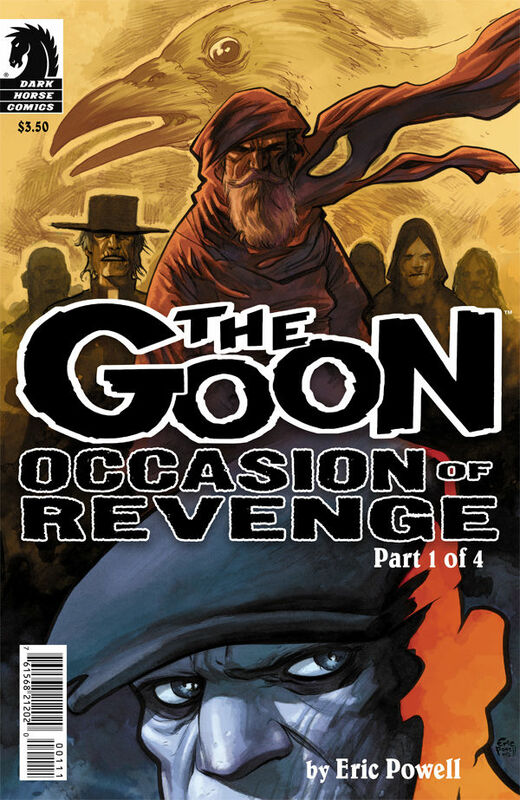 The Goon: Occasion of Revenge #1 is a book that fires on all cylinders and then some. It's a great introduction to the character for those who don't really know much about him, but for fans of The Goon the book continues a story that is just plain awesome. All of the characters have their own voices, largely in part they're characters Powell has lived with for so long. His time with the property has afforded him much time to hone his style as well, presenting characters who are extremely engaging and in a style that screams pin-up, where every page could easily be ripped (or taken delicately) from the book for display. 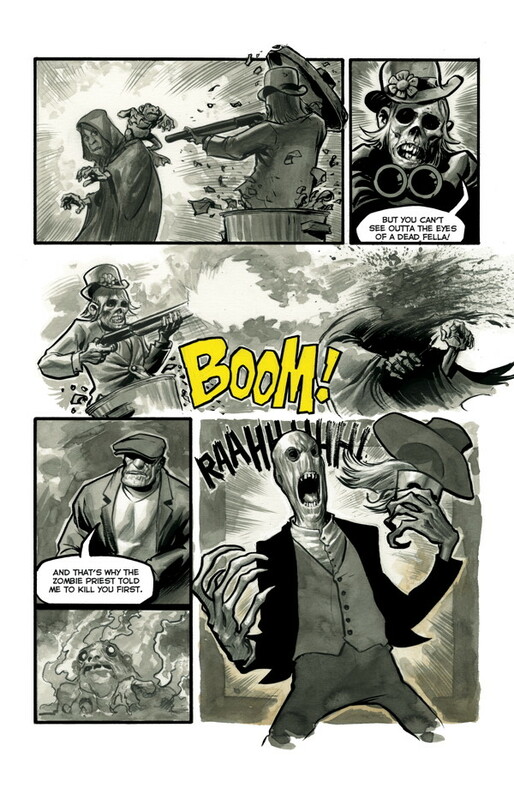 The Goon: Occasion of Revenge #1 is extremely enjoyable and represents a very good book for readers new and old to pursue the exploits of The Goon and his buddies. 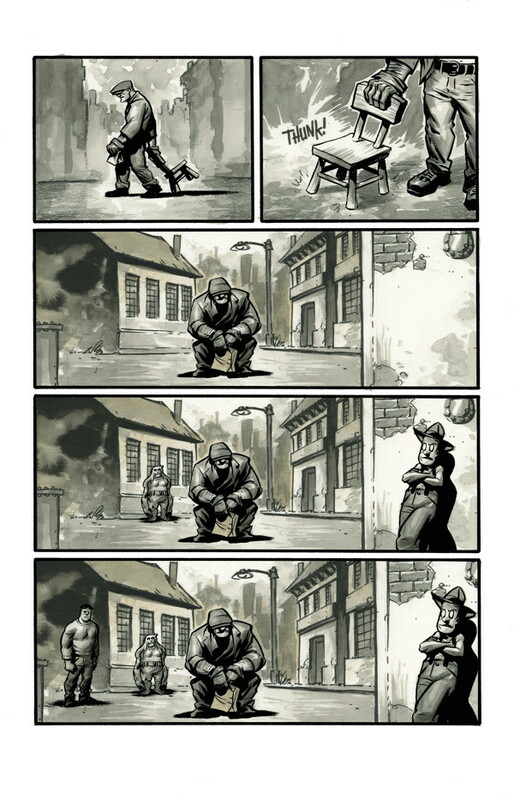 The Goon: Occasion of Revenge #1 is in stores July 23 with interiors below.